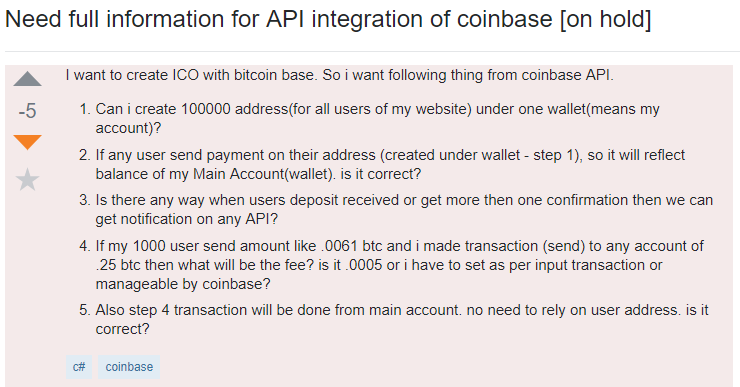 This causes questions like https://stackoverflow.com/questions/47905371/need-full-information-for-api-integration-of-coinbase to be dumped here by people who haven't read the Tour nor How do I ask a good question?. Can someone contact them to explain that this isn't how it works? I contacted their customer support system, but it seems as if they are going to take several days to respond. I'm poking around to see if I can contact someone working on the API, which is probably going to be more effective at getting the site fixed in any case. Note: this tag is for questions about the Coinbase API for buying, selling, storing, and transferring digital currency. Please do not ask general support questions here. I'll edit this answer if I get any response from Coinbase. There is a canonical help page for this, as it is a fairly common occurrence: https://stackoverflow.com/help/product-support It sets out what we expect from third parties who want to link to us in this way, to ensure that everyone gets a positive experience. I suggest politely (Assume Good Faith) linking to this in comments on any off-topic / low quality questions which seem to have come from this route; if Coinbase staff are monitoring the tag, this will help bring it to their attention. If they are not monitoring the tag, someone will need to contact them a different way. In my view, it would be fine for this to be from any member of the community, but we don't want to flood them with e-mails (again, assuming good faith), so post an answer here if you have done / are planning to do this. If they don't respond, or don't provide a reasonable means of contact, then it would be appropriate for Stack Overflow Community staff to try to find more official channels. Not the answer you're looking for? Browse other questions tagged support outsourcing . If I (a non-Teams admin) create a Slack notification, is it supposed to be visible to everyone on the Team?